This is our most popular and most loved holster. The easily interchageable belt loops take you seamlessly from your outside the waistband range set up, to your highly concealable inside the waistband daily carry in no time at all. It features easily adjustable retention and it is designed to be so comfortable and lightweight, you may just forget you're wearing one. 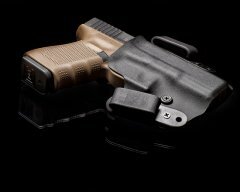 This is truly a 2-in-1 holster with the same comfort level open carrying or concealed carrying. 2-in-1 design for Inside the Waistband or Outside the Waistband carry. Rolled lip for easy reholstering. Curved to your body for ultimate comfort. Includes a set of IWB J hooks and outside the waistband belt loops.